I have three extension ladders, and I don't put any of them up without the stabilizer on them. By being able to take it off, it make it easier to move the ladders. 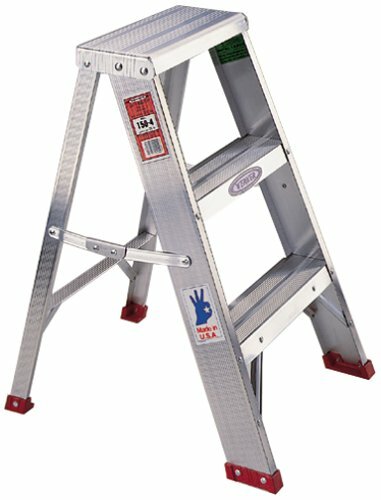 I can also use it on any of my ladders. It makes the ladder very stable. The stabilizer fits very well on the ladder. The quickclick stabilizer is not as handy as one would think. Yes, it is easy to take off and put on, but when you have a variety of extension ladder heights that you are adjusting your ladder to, it is easy to forget that the quickclick stabilizer limits the ability of the extension ladder to be placed at its shortest length. If you are not careful, when the extension ladder is placed at its quickclick impaired shortest length the quickclick stabilizer safety pin is what the ladder is supported on. If the pin should break (and it is a only a 1/8th inch diameter pin), the ladder will drop down to its true shortest length and the quickclick stabilizer will come off. 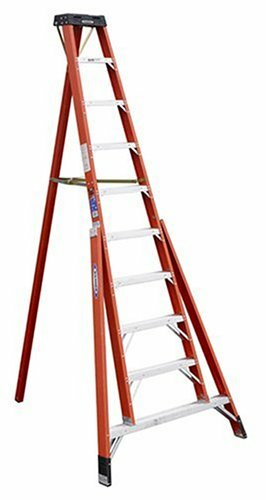 I already had one of these and since I'm now getting a whole ladder jack setup along with a second ladder, I definitely wanted one of these to go along with it. I'm sure they wouldn't recommend what I'm about to say for safety reasons, but I would point out that this item can make an aluminum extension ladder a lot more stable on slightly uneven ground. Because of the broad spread, the ladder will twist slightly to make up the difference and it's really solid! This thing goes on or off in 5 seconds. No way would I ever get one of those bolt on kind. The cam action that holds it to the ladder looked a little iffy when I first saw it, but if you examine it you'll see that it's very well designed and I don't think you'll ever have a problem with it. I haven't. The instructions are detailed and didn't leave anything to the imagination. The instructions have different sections for the different ladders and require a careful study before and during the installation. At least the instructions are only in English, having multilingual instructions would make it way too confusing. Installation took about 3 hours to accomplish for my D6020-2 20' fiberglass ladder and its a little scary permanently modifying such a nice ladder knowing that if you mess up the ladder can be permanently damaged or made useless. Take your time. Here is my list of things to be aware of going into this installation. 1) Be very careful aligning the drilling templates!!! 2) Center punch the hole positions good then your drill bit shouldn't wander. I didn't need to do this but you might pre-drill the holes with a smaller bit if necessary. You have 6 holes to drill over about 14" x 3" area so the drilling must be done very precisely if the side rail is to align correctly. The rail bracket doesn't have any give in it for error. 3) Double or triple check your measurements/instructions and drill bit sizes. Be very careful sawing off the square aluminum bar that runs through the rung as it has to be within 1/8" accuracy. 4) Don't remove the black electrical tape that comes on the side rails, this is done near the end of the installation. 5) Hack-sawing the side rail is the easy part. Previous review recommends a cutoff wheel which I'm sure works well but isn't necessary. Before doing this I'd mount the side rails to check your drilling accuracy. This is the point of no return before cutting off the existing ladder feet. If you messed up the drilling which I'm sure you won't if you are careful you can always abort the project here if necessary. The holes shouldn't hurt the ladder but cut off the feet and their side rails supports and, game over. 6) Drilling out the heavy rivets from the bottom rung is a royal pain and maybe a cutoff wheel would remove the head faster. I don't do that everyday so I'm sure there are better methods. 7) Have a good clutched drill and a 7/16" socket and it will speed up putting the 14 nuts on the side rails and the two feet. 8) Make sure you have good sharp drill bits, the sizes are indicated in a previous review and note they are less common drill bit sizes. 9) Wear a mask for the fiberglass drilling. Good product, the ladder is definitely better and even stronger when the project is finished! 1. Installation should be done by an experienced handyman. Allocate a few hours to do the installation. Messing up the install may ruin the ladder, as the original ladder feet must be cut off. 2. The ladder will be somewhat heavier with the levelers installed. 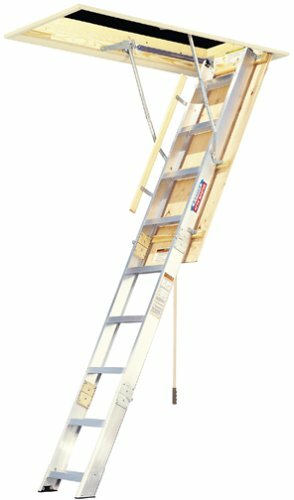 Before the levelers, I was able to easily move my 26-foot fiberglass extension ladder; with the levelers, I typically require help handling the ladder. 3. Installing the levelers widens the ladder foot spacing, as the levelers are placed outboard of the ladder rails. The resulting width is greater than the depth of two standard stair step depths, and the adjustment range of the leveler won't span two standard step heights; so, if your expecting to use the ladder against a wall with the feet on different steps of a stair, you'll likely have to still need some sort of platform/spacing under the lower foot. The tools required for the install are: Power drill, 5/32", 3/16", and 9/32" drill bits, two 7/16" wrenches or sockets, #2 Phillips screwdriver, a hacksaw (I used an air-driven cuttoff tool), center punch, square, straight edge (2' or longer), scissors, pencil or marking pen, tape measure, metal file (sandpaper is also usable), adhesive tape, goggles, dust mask and gloves (for fiberglass ladders), and a 1-1/4" hole saw (for fiberglass ladders with rungs riveted to side rails). Other tools listed in the instructions (for 2-section D1500 series ladder only, which I don't have) are 5/16" wrench or socket, 3/8" wrench or socket, 1/8" diameter punch, chisel, and C-clamp. IMHO, the install is easier to do if you use air tools (i.e. : cut-off wheel, air drill, butterfly wrench). Also, the reattachment of the spacer sleeves is easier with rivets, instead of screws. I'd also suggest drilling pilot holes for the side rails as the 9/32" drill bit easily drifts off center when drilling through fiberglass; even after using a center punch. I have a set of these on my 20 ft. ladder, and I am in the process of purchasing a set for my 32 footer.........I don't want to paint another day without them. They save time, work great, and most of all I don't worry that a block of wood will slip out from under the ladder leg . 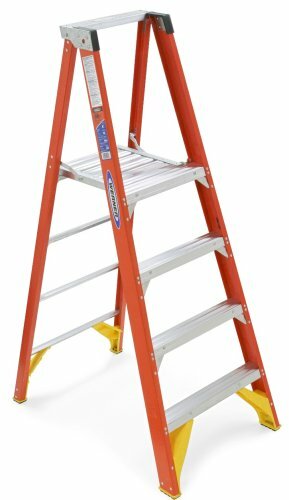 This is one product that can make your job much safer and easier if you use ladders a lot. I have these on all three of my ladders, and wouldn't use a ladder without it. 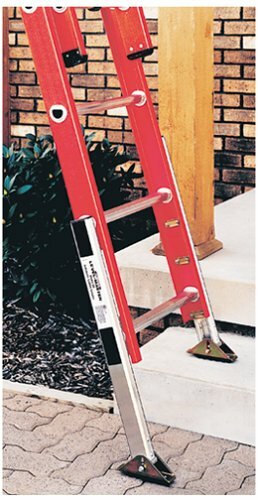 It makes it very easy to use the ladder on an uneven surface. As a remodeler every job I go to to work and pull out my ladder, all the other trades want to use it and then keep it. I have "killed" other 2' ladders and almost me by stepping off the wrong side, but not this one. You cannot go wrong here! I rate this a 5 star investment. Just a great ladder. You can easily stand on the top step without having to worry about losing your ballance or your feet getting tired. It fits in small places and is easy to carry. It is also the right hieght for working in houses. I was given two of these ladders over a year ago, and used them so much that I ordered two more! Although a bit heavy/bulky for the taste of two of my people, the rest of the crew loves them. One of our more common uses for the stool is to set them up as indoor scaffolding when performing lengthly ceiling/overhead work. Sorry I didn't discover this item years sooner! 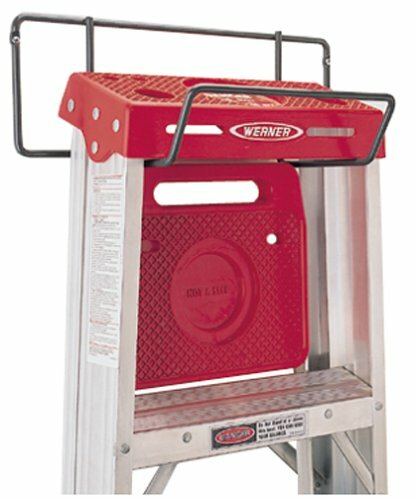 We recently purchased several of these Werner 2' Tall Fiberglass twin step stool / ladders. They are the handiest ladder we have ever owned. 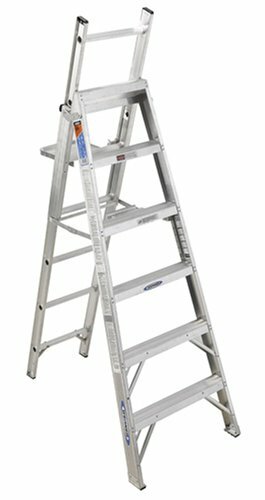 The height of this ladder makes it perfect for countless projects from framing, wall papering, painting, changing lights, electrical work, projects in the ceiling of your basement and the list goes on and on. 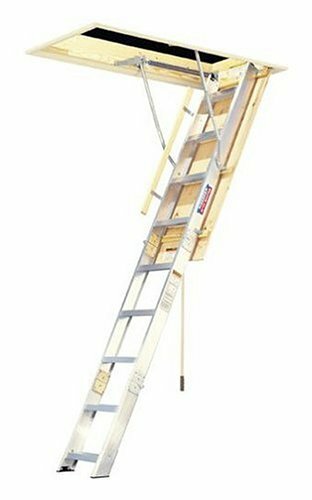 Seriously, you will love this ladder and find uses for it that you never could have imagined......Plus, Amazon's price is very competative and the freight special is makes this an even better value, as if it needed any help! 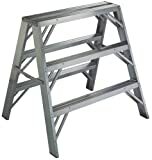 Floor to floor Height range 8'9" to 10'6"
Floor to ceiling height range 8'5" to 10'3"
Rough opening width-length 22-1/2" x 54"
I needed a short stable ladder to for general purpose use on many job site tasks. I get a sure footing on any tread, even the wide double top tread, (although a warning label says not to climb above the first tread). It's lightweight, has a wide stance and works great as a saw horse to hold the end of a long board. I will probobly get a second one to span a length scaffolding across. It's the ladder I now reach for first on a job site. Meets OSHA and ANSI standards, Type 1A, 300 pound duty rating. Easy to install, protects surfaces from ladder end damage. I installed a pair of these on my 40' Werner fiberglass extension ladder. They work wonderful, protect the exterior wall which I was painting last fall while I moved the ladder up and down. 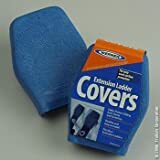 Installation was simple - just slip these covers over the ladder ends. 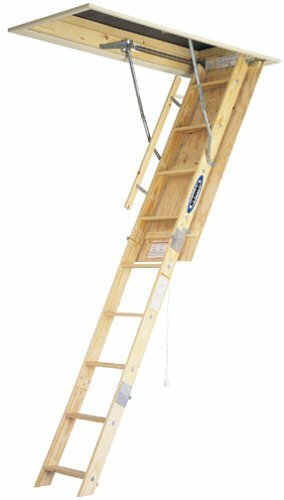 Floor to floor height range 7'4" to 8'9"
Floor to ceiling height range 7' to 8'5"
Help - my rivetted mechanism has also broken on model W2508 and I don't know what to do - it's a real bummer - I can't see why I would need to buy a new attic stairway - can't I buy a new bracket and drill it into my existing frame. Platform size is 14 5/8" x 15"
Platform size is 14 1/2" by 12"
Spill-Proof pail holder contains rag rail and convenient tool holders.